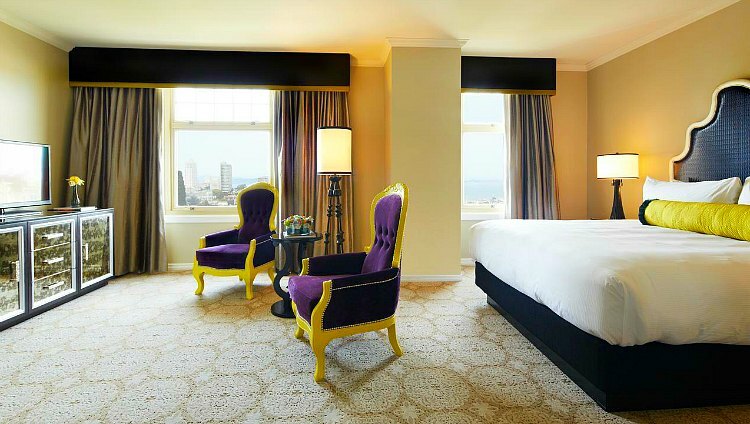 Are you looking for the best San Francisco luxury hotels? There are a number options, but which ones really stand out? Here you will find the top guest-rated high-end accommodations in the best SF neighborhoods, including downtown, Nob Hill, and Union Square. 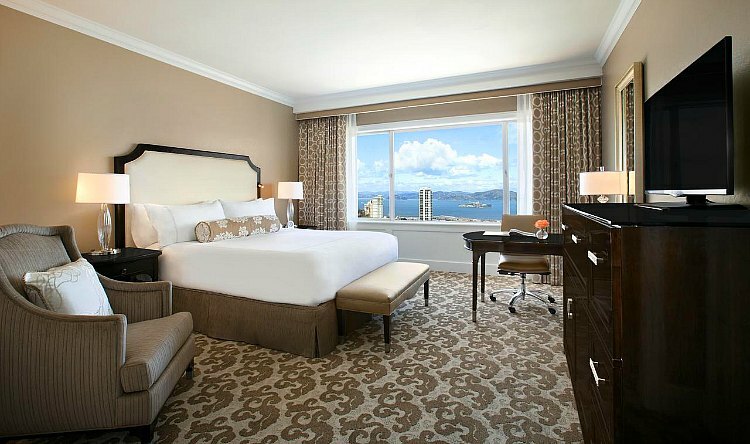 The Fairmont Heritage Place is the first of the San Francisco luxury hotels on my list. It set inside Ghirardelli Square and a favorite among travelers. This hotel offers one-, two- and three-bedroom apartments or suites, giving you quite a bit of additional living space and privacy for your visit. The views of the waterfront also make this place special. 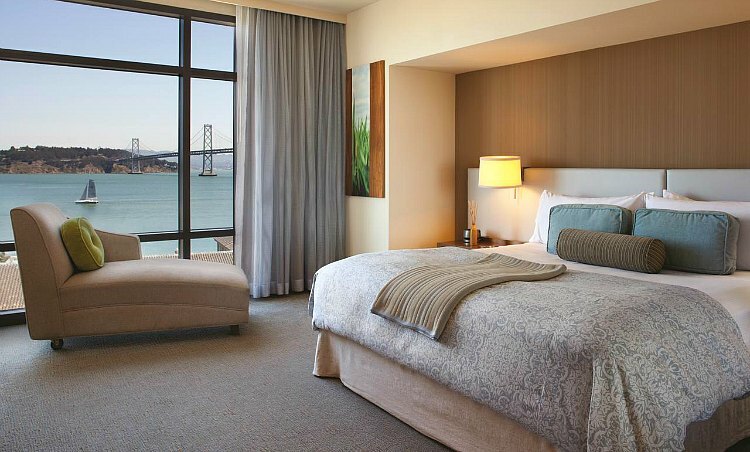 Most rooms have an outdoor terrace with a fire pit and breathtaking views of the gorgeous SF Bay. Find the best deals for the Fairmont Heritage Place on Booking.com. The St. Regis is one of the newer options on the scene. 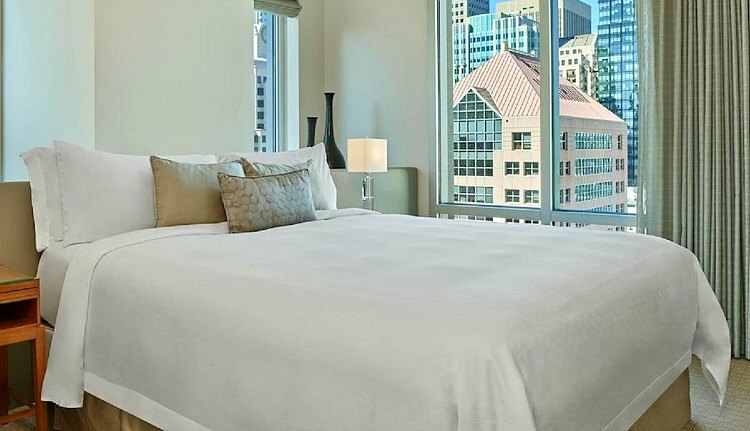 This is one of the San Francisco luxury hotels that is well situated near the Yerba Buena Gardens, the Museum of Modern Art, and other cultural museums in downtown San Francisco. The top 20 floors of this 40-story building are dedicated to St. Regis guests. You get an amazing view of the city from just about any room. Find recent guest reviews and the most competitive prices for the St. Regis on Booking.com. The Omni is the best of the San Francisco luxury hotels in the Financial District, making it perfect for business travelers. It's also great for tourists, as it's within walking distance to the Ferry Building, Chinatown, and Union Square. Once you enter the lobby, you will notice this place's modern feel. You'll find the rooms spotless and up-to-date. Make sure you ask for a courtyard-facing room for the best views. The staff here will make you feel at home. If you have any questions about SF, the knowledgeable concierge staff will be more than happy to help. Read guest reviews and compare prices for the Omni Hotel on Booking.com. Another one of my favorite San Francisco luxury hotels is the Mark Hopkins. This gorgeous hotel was built in 1926 and sits on top of the hill in the famed Nob Hill neighborhood. The Top of the Mark restaurant and lounge is located on the 19th floor, where you can sip on your choice of 100 martinis on the menu as you gaze out at the beautiful skyline. The restaurant area serves up fresh California cuisine and has an impressive wine list. Compare prices and find the best deal on the Mark Hopkins on Booking.com. Right across the street from the Mark Hopkins is another one of the popular San Francisco luxury hotels, the historic Fairmont San Francisco. It opened in 1907 and was remodeled in 2001. Even if you don't get a chance to stay here, I'd highly recommend taking a peek inside at their beautiful lobby. The decor is gorgeous from floor to ceiling. The entire lobby is decorated in gold tones and other warm colors. The flags outside the front entrance celebrate this hotel as the location where the United Nations charter was drafted in 1945. The staff is also more than happy to point out other key pieces of this hotel's remarkable history. See pics and read more about this hotel. 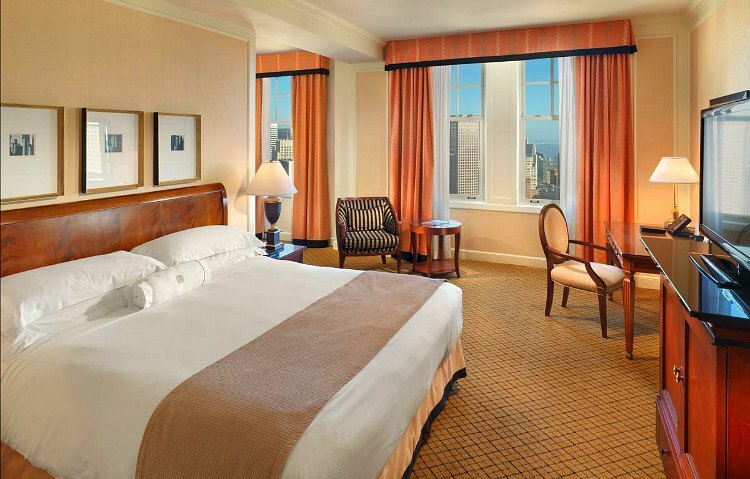 Find reviews and competitive prices for the Fairmont San Francisco on Booking.com. One of the newer San Francisco luxury hotels is the Hotel Vitale. 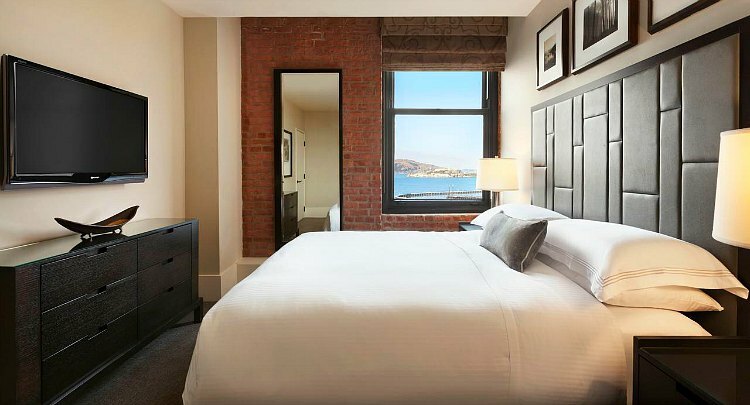 This hotel is set along the beautiful Embarcadero waterfront near both the Ferry Building and the Bay Bridge. The on-site restaurant has a great bar with outdoor seating that is covered and heated for those chilly San Francisco nights. Discover the more competitive nightly rates for the Hotel Vitale through Booking.com. Heading back up to the famed Nob Hill neighborhood, you will find another one of the great San Francisco luxury hotels, the Huntington Hotel. This gorgeous hotel is located about a half a mile from Union Square. It's also just a few blocks from the Financial District and Chinatown. The Big Four restaurant is located in the hotel lobby. The large guest rooms feature a king bed and premium television channels. 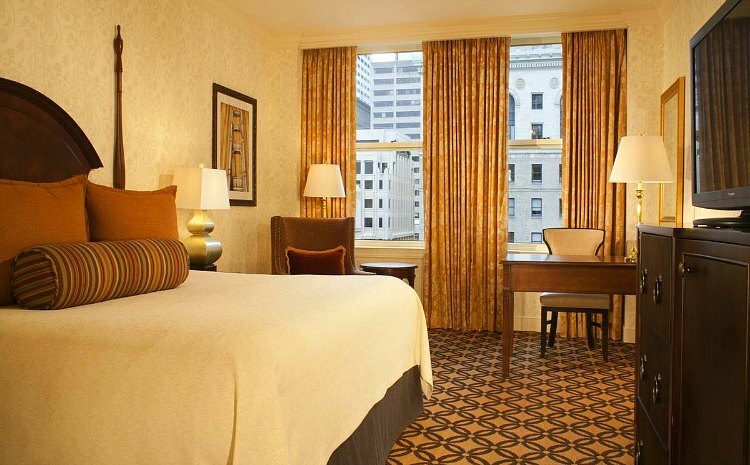 Uncover the best nightly rates for the Huntington Hotel on Booking.